This is to announce that the Random Number Generator has spoken, and the winner in the drawing for the Mike Schmidt streamer giveaway is #29, John Helton. I want to thank everyone who participated and read Mike's interview, and also to remind you that I have more to come. 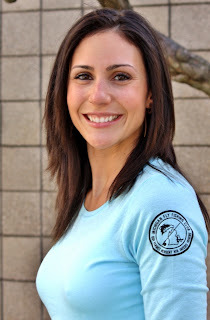 Up next- April Vokey, so stay tuned. If you haven't seen it, be sure and read my interview of Eric Stroup this week and enter to win a copy of his book "River Pimp". By the way, I did announce on Facebook last week the winner of the TFM swag, but should announce it here as well, so congratulations to Dave Kuntzelman. I'll be fishing all weekend- I'll try to get you some fish pictures. I have a confession to make. Before doing this interview, I didn't know who Eric Stroup was. I had decided to conduct five interviews at the Midwest Fly Fishing Expo this year (I did eight), and the first four people- Cameron Mortenson, April Vokey, Mike Schmidt, and Kelly Neuman- were either people I knew personally or at least had had some contact with and was aware of their work. For the fifth interview I decided to pick someone at random, someone I knew nothing about. In looking through the list of vendors I decided on Eric Stroup. I recognized his name, but I didn't know why. I sent him an email requesting this interview and then started my research. This is when the anxiety set in. 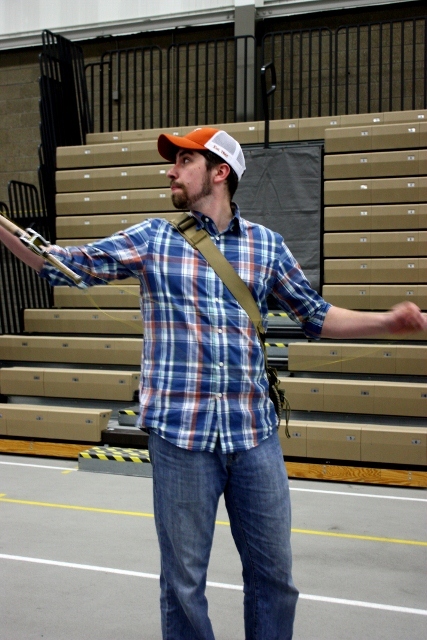 You see, it turns out that Eric Stroup is a giant in the world of fly fishing. He's worked almost his entire adult life as a commercial tyer, a fly shop owner, outfitter and guide. He has fly tying videos out on various outlets, he has two books out with a third on its way, has been published in all of the relevant magazines, and he gave a ton of seminars and demonstrations at the Expo. This was perhaps the most intimidating interview I have conducted- this guy knows his crap, and I had better not screw it up. Eric has given me a signed copy of his book "River Pimp" to give away to one of my readers. Be sure and fill out the form at the bottom of this post to enter to win it. ES: I’m a fly fishing guide in Central Pennsylvania, and a writer, with a couple of books out- “Common Sense Fly Fishing” and "River Pimp". I’m working on another book with Stackpole books called “Catching Trout in Tough Conditions”. 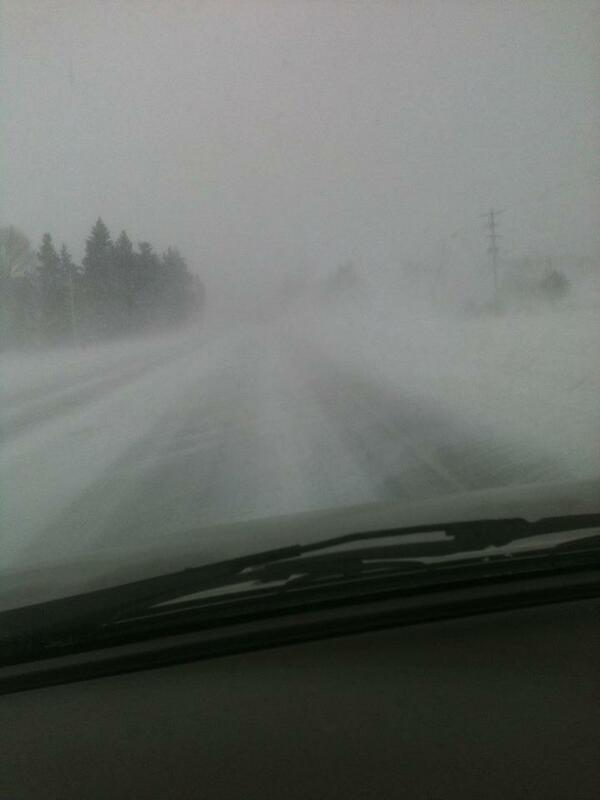 FR: Do you have tough conditions where you live? ES: Yeah we do. Our fishery is very technical. It’s got hatch fishing basically twelve months out of the year, so you have to know what you’re imitating, it really helps. Our streams are all limestone, so we have tremendous bug life. FR: So you’re located in Central Pennsylvania- what’s your sales pitch? Here in Michigan we have a great fishery, but I still always hear people say “Yeah, this is pretty good, but it’s not Colorado”, so how do you get people to fish in Central Pennsylvania? ES: We’re like Montana, except we’ve got twelve months out of the year. Our streams are all wild, our best streams are wild, they’re wild fisheries that are open year-round. You don’t have to drive forty miles to get a gallon of milk. It’s good technical tough fishing, wild trout, and open year-round. FR: Fantastic. You’ve been guiding for some time, have you had any memorable disasters on the river? FR: Oh, he fell into the river? ES: He fell in. I had two sports, I was with the other guy. He fell in and never got up. By the time I got down to him he was in a real heavy riffle. He was under water and I had to drag him out, broke a couple of fingers dragging him out, got him to the bank, performed CPR on him. Fortunately we were on one of the only places on the stream that had houses close by, and I sent the other guy to call 9-1-1. We live in a pretty rural area, and it took about 35 minutes for them to get there. The guy got back to me, said they were on their way. Come to find out he’s a doctor. Anyway, the guy lived. He made it, and I ended up fishing the rest of the day with the doctor since the other fella was in good hands. It was memorable. FR: We hear a lot about fracking here, is that a concern in your area? ES: Not in my immediate area. It’s a concern north of us. We don’t have the conditions for that right where I live thank god. I think the hardest thing for me is to find good accurate information on it. It’s so politically charged, in both directions. I don’t know a whole lot about it; so far in my area we’ve been safe with it, but we’ve had disasters already in Pennsylvania, where the fluid gets released into a stream and it just kills everything. FR: It’s kind of a farming community where you’re at right? So you’re probably more concerned with run-off issues right? ES: Yeah. For the most part where I live, our water has never been cleaner than it is now. Our trouble now is with some of the development. We’re drawing a lot of water out of the system, and we’re starting to see the effects of thermal pollution. FR: From clearing the land? ES: Yeah. Some of our streams are having those effects. By and large our area is pretty immune to the major issues of the day. For another sales pitch, that’s what it is. FR: You called your fishing technical and it sounds like you have good fishing. What would you say to an angler that wants to come out and fish with you? What do they need to do to prepare? ES: You’ve got to fish well. You really do. Take your game to the next level. Most of what we do is a nymphing game, our fish ar wild. We’ll put a dry fly on when they start rising, but it’s not a good way to just go out and fish. You’ve got to nymph well, you’ve got to be deep, you’ve got to get good drifts. You’ve got to have a stealth factor to you. I think a lot of guys that we guide, they come in, they’re used to fishing stocked fisheries, where you can go in like the guy who did ten minutes before you and catch a couple of fish. Our fish, if you spook them, you’re not going to catch those fish, so you’ve got to move. You’ve got to be at the peak of your game. Which I like, I think that makes it very appealing to me. FR: You’ve been successful in this business- you’re a successful guide and author. What do you say to a young person who wants to build a life in the outdoor world? ES: Work hard. It just takes a lot of work. Show up every day, do something productive every day that will take you to the places you want to go. It’s the same in any business- be honest and work hard. I think that eliminates about 60% of your competition. Not that this business is dishonest. By working hard you beat about half of your competition, just because it’s their hobby. If you want to make it your life’s passion you’ve got to bust your nuts and work hard. There’s always going to be this guy who does this on the weekends and charges half of what you charge. You’ve got to take it to the next level; you’ve got to do something that separates you from those guys. There’s nothing wrong with those guys, we’re all ambassadors to the sport, but if you want to make a living out of it, you’ve got to really be a little bit creative and work hard. FR: One last question- I just read an article in which Yvon Chouinard referred to the dying fly fishing industry- is the sport dying, or is the industry just over-bloated? FR: A lot of that was fashion wasn’t it? ES: Yeah, I think it was. Today lots of people tie flies. If you want to do this there’s a million resources to find out how to do it. When I started doing it I went to a hardware store in town. There was one guy there who tied flies and he could get materials for you. If you didn’t know someone who did it, it was really hard to learn. Today we don’t have that problem. There’s a lot of young kids today who are unbelievably good. I think that’s good for the sport, because you don’t have that long learning curve anymore. People that get into it, they get decent at it, they get proficient fairly quickly, and they enjoy it a lot more, so they stay into it more. I really reject the notion that the sport is dying. I don’t think it is at all. I think we’ve got some issues with the buying public and where they’re buying. That’s what I based my book “River Pimp” off of. The real ambassadors to the sport are us in the shops, and if you eliminate the shops then I think we may have an issue. FR: Well, I know we have to get you back to the authors table, but I really appreciate you spending a few minutes to talk. Eric has kindly given me a signed copy of his latest book "River Pimp" to give away to you, my readers. Just fill out the form below and I'll use the Random Number Generator to draw a winner next week. Entry deadline is Wednesday April 4 at midnight. I bought a copy and have been reading it and can say that it is thoroughly enjoyable, an inside look into the life of a guide and shop owner, but also a glimpse into the beauty and peace of the area where the Stroup's live and fish. It makes me want to go. Aaaauuuuuugggghhhppphhhhh. Yaaaaaawwwwn stretch, scratch, repeat. I hate waking up tired on a Monday. When you have to go back to work to get some rest it's a problem. This calls for a serious amount of coffee, so let's have some. Drink it black or not at all. It's been a quiet week in Lake Wobegon.... wait, wrong monologue. It has been a busy week here at Fontinalis Rising. The big news last week was the arrival of the March heat, with 80+ degree days for most of the week, and thunderstorms at the end. Everything here is a month early- the birds are back, I got bit by a mosquito last weekend, the trees are budding, and down near Traverse City some of the cherry trees are starting to bloom. With 5 more weeks of frost danger, this is not a good thing. Yesterday the temperatures plunged 20 degrees while fishing, a welcome return to normalcy. I fished a lot this last week, heading out after steelhead several times after work. The fish are there, but you'll have to work for them, and a lot of the rivers are high and dirty from combined run-off and rainfall. I look for the runs in Northern Michigan to peak over the next two weeks. Inside info from the DNR is that they fear the smelt run will happen before the season opens April 1. Speaking of April 1. Michigan anglers- make sure you get your new fishing license this week if you're heading out, as your old one expires on this coming Saturday. I got mine this weekend. It's orange this year. I received a pair of Redington Sonic Pro zip-front waders to test and review and I already have four trips on them. My initial impressions are positive and I'll post an overview of them this week, and then do a more exhaustive review after beating on them for a couple of months. They have already gotten a taste of my Michigan fishing- bushwhacking through thick brush up and down high banks deep in the backcountry. I hiked about six miles in them yesterday. Kirk Werner keeps telling me that a gentleman my age will find the front zipper very handy- I'm not sure how old he thinks I am, but it is nice for getting at my keys. TC show. You'll be hearing about them later on. 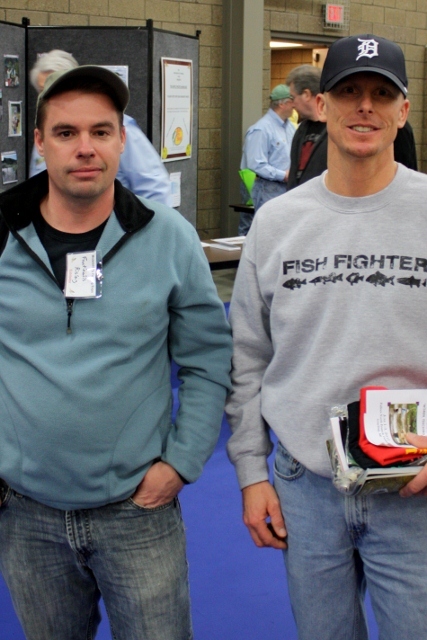 I attended the Traverse City Hunting and Fishing Show on Saturday. I'm not sure why- I'm still sorting through the massive pile of material I have from the Midwest Fly Fishing Expo two weeks ago. 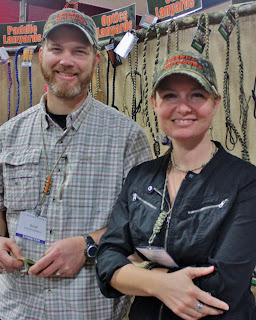 The TC show was fun, and I met some great people there, including Michigan taxidermist Paul Borkowski and a couple of local gear manufacturers with great products which I'll be sharing over time, and even have a review or two to do now. I continue to be snake-bit in the steelhead department. I had a decent buck all the way to the net before losing it while fishing with Au Sable river guide Kevin Foerster this week. Then I had one on briefly yesterday while fishing with Alex Cerveniak. I had one on briefly Wednesday night while indie fishing, but when I went to set the hook I hit the tree limbs overhead, which subsequently wound my line through cedar needles. One silver flash was all I got. I've got to get this monkey off my back. Alex says I jinxed it yesterday by catching a brook trout right away. Maybe I jinxed myself by taking on the nom de plume Fontinalis. 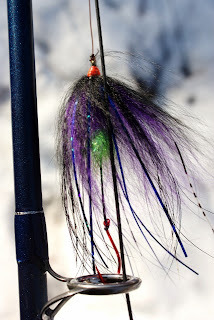 If you haven't already, be sure you read my interview of tyer Mike Schmidt and enter to win some of his streamers- entry deadline is Wednesday at midnight. 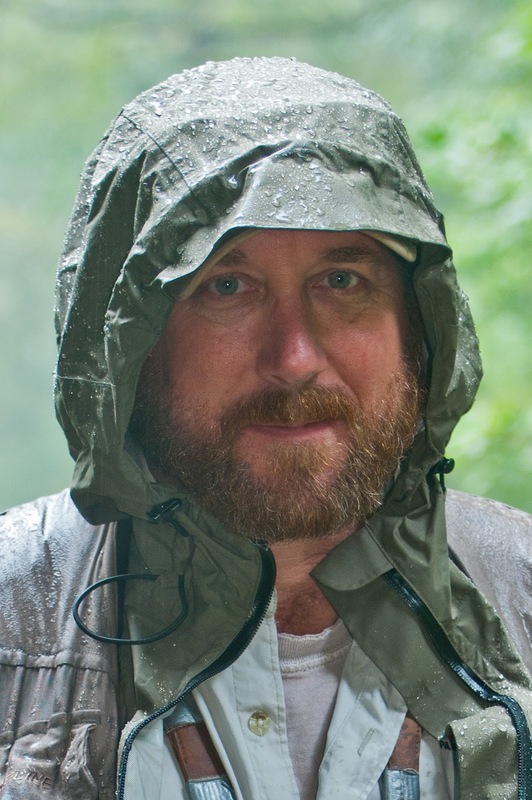 I'll be posting my interview of Pennsylvania author and guide Eric Stroup on Wednesday, and I have a signed copy of his book "River Pimp" to give away, so don't miss it. As always, this post is running long and I have to run out the door to work. Let's get after it. lots of fishing this week. no fish. Aaauuuugghhhppphhh.... yawn, stretch, scratch, repeat. Stumble and bumble to the kitchen, eyes half open, fumbling for the light switch. Run the water until it's nice and cold (does this make a difference? ), pour out the leftover water stagnating in the electric kettle since yesterday and take a peek inside. The element is starting to get a heavy coat of scale from the hard water we have- I'll have to soak it in vinegar soon. I fill the kettle half-way, click it neatly back onto its base and push the button, then turn my attention to my french press. I pull off the plunger lid, scoop out yesterdays grinds by hand and give the whole thing a thorough rinse and wipe-down. Now the coffee. For my taste, 3 scoops of whole beans make the perfect pot, and they must be whole. Flavored beans are out- flavoring is a great way to sell bad beans, and any true coffee snob will be able to detect those rancid flavors underneath that heavy layer of Irish Kream. I'm not a total nut- I don't have a burr grinder, the kind Alton Brown claims is essential to perfect coffee. I've priced them things. I've had my blade grinder for 19 years and we're starting to get to know each other. Except for some rare occasions, I've used it every day, and I grind my beans by sound. When the loud clacking of whole beans muffles down just so under the assault of the blades it's ready. By now the water is boiling and the kettle kicks off. 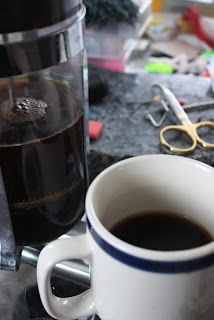 I've seen people use a spoon to stir the grinds into the water, but there's a simpler method of ensuring a good steep- just gently depress the plunger half-way then pull it back up. Four minutes later my coffee is ready to pour. So let's have a cup. 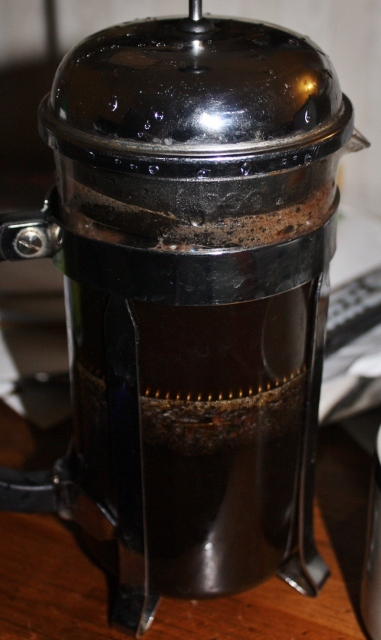 French press coffee is one of life's truly guilty pleasures. I'll never forget my first taste, sitting in my friend Karen's kitchen in Kalamazoo. It was heavenly. It has a creamy, almost unctious body, and produces the richest coffee aroma possible. They say it's high in cholesterol. I don't care. Karen was an old friend I hadn't seen in years who I had bumped into by chance. Tall, red-haired, with a strong personality, she had insisted that my brother and I crash in her and her husbands basement instead of sleeping on cots in that empty apartment. Karen had retained her nutty sense of humor after all these years, and her hair was just as crazy. I remember mocking her back then for having to pet every dog that came within sight, and the odd part was that even mean dogs that would go after me would let her pet them. I don't know if they sensed her strength of character, that they were no match for her, or if she was just really good with dogs. I fished quite a bit this week. With Daylight Savings Time kicking in, there is now lots of time to fish after work. Melting snow and heavy rains have brought the rivers up, but also brought in a few steelhead. I hooked up on a big one Wednesday night that I didn't get to see. I hooked up on another smaller fish Thursday. I took a local reporter fishing Friday and she hooked up on two fish, the second one running her around for nearly ten minutes before coming unpinned. I hooked up on one Saturday morning first thing..... I've been feeling a little snake-bit lately. I've hooked up 5 times in 3 trips, and no fish to hand. I call this "the twenty second dance" and thus my post Saturday. The big news this weekend was the weather, with record setting highs of around 80. The nice weather really killed the fishing. I fished with Alex Cerveniak Saturday night and we were sweating in ball caps and T's. Alex was good enough to jinx the trip by catching a small fish right away. I have been invited to join the Isle Royale "Coasters" 2012 Qwest, in search of the fabled Lake Superior coaster brook trout, a lake-run form that grow quite large. Should I go? Ha, dumb question, of course I'm going. We will be filming, photographing and writing about this trip. The coaster brook trout used to be numerous in Michigan's Upper Peninsula, but only remnant populations remain. Only in the waters of Isle Royale National Park are they said to be common, and we're going to see if we can catch one. 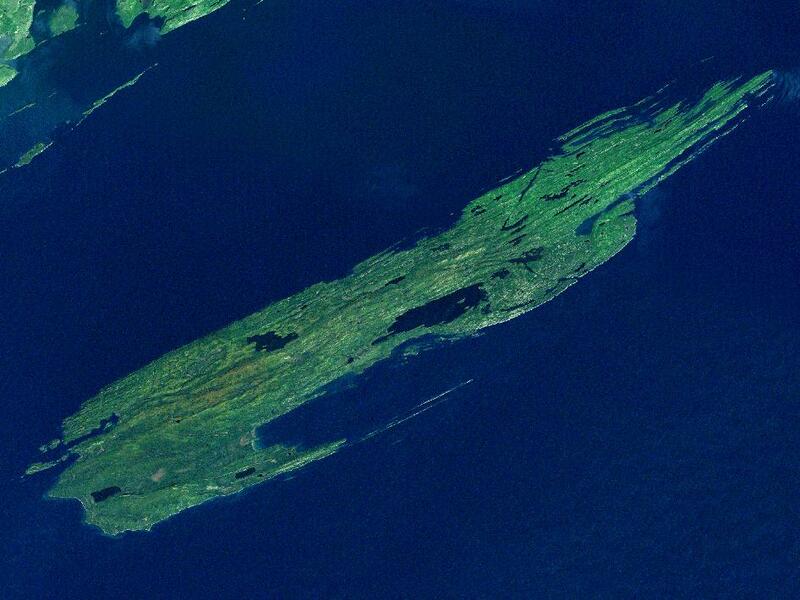 Isle Royale is a rocky and mountainous island about 45 miles long, far out in Lake Superior. It has numerous inlets and islet and I''ll be bringing my kayak. 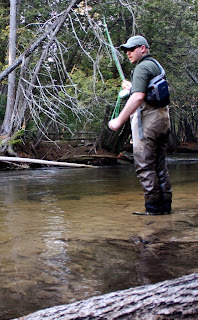 We are looking for sponsors for the trip, and we do intend to use this opportunity to shine a light on the plight of coaster brook trout in Michigan waters. If you would like to sponsor our trip in any way please contact me at fontinalisrising@gmail.com. I'll be writing about this adventure, and Michigan author Wayne Snyder will be on this trip as well. Go "Like" our Facebook page and keep an eye on how things develop. I have several exciting events and new features coming to this site soon. I still have lots of cool items to give away with upcoming interviews, and some other swag in the works. Check back each week. Get yours. If you haven't already, make sure you read my interview of Cameron Mortenson and enter to win a free Comrade motif T. One of my giveaways will be to reward my followers, so if you're not following, you may want to take care of that. To continue my "Good Takes" series of interviews, I'll be posting my interview of tier Mike Schmidt of Angler's Choice Flies Wednesday. 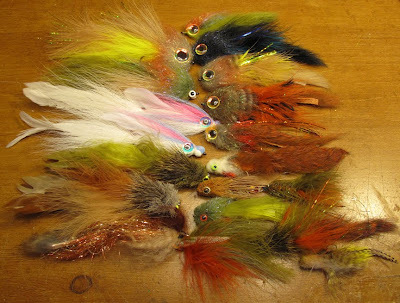 Mike is one of my favorite tiers out there and we'll be giving away a half dozen of his streamers and a fly box for them with the post, so don't miss out. Okay, it's time to go to work. It's going to be a busy week, let's get after it. I’m standing in frigid running water past my knees. The cold is shocking, but its music soothes, beckons me onward. I two-step, one-two, moving into position. This part of the dance is a shuffle, the opening steps in an intricate ritual. Like many dances you start with your feet, then, as the rhythm of water and sound take over, your whole body will move. Cast and swing, cast and swing working each riffle, finding each rock and eddy. I work thoroughly across my ballroom in search of a dance partner. 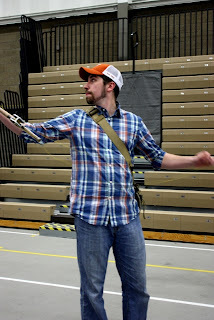 The longer I cast the more relaxed I become, the more natural and beautiful the moves. Shuffle, cast, swing, strip, shuffle, cast, mend, swing, strip, still in search of a partner. I’m no wallflower, all I want is one fish, one dance, one chance to be a part of this moving, swirling room. You won’t get a partner standing off to the side, staring wistfully at the crowd- you have to wade in, moving to the rhythm, working the floor until you find that one partner that says “Yes, I’d love to”. If you stop, stand in one place, the rhythm is lost. You must keep moving, keep dancing, no matter how foolish you look or feel. Not every dance is meant to be. At times you will move from partner to partner, a twenty second dance. She'll leave you jilted and stunned, standing on the dance floor feeling guilty, wondering "What did I do wrong?". If you are the right height, the right build, if your eyes meet just so, if you are well matched, if it's the right song for both, you may just see this one through, move through all the paces, exhausting yourself until the music ends, you dip your partner and take a bow. Most people know Cameron Mortenson as the helmsman of The Fiberglass Manifesto. Through it Cameron shares with the world all that is stylish and artistic in the world of fly fishing. He has taken fiberglass rods and made them cool again, or rather, shown us that we were the ones that had strayed, forgotten our roots and disrespected our elders. Cameron seems to have a knack for finding obscure equipment, and builders and manufacturers who are making high-quality gear, and shining a light on them. 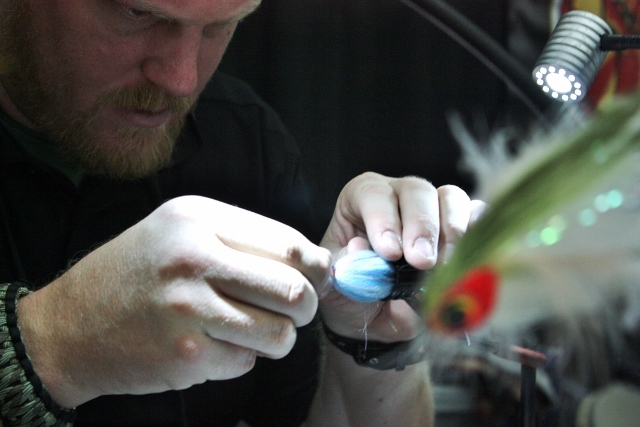 Whether or not you are a “Glass Geek”, your world as a fly angler is that much better for stopping by his site. I have a personal connection with Mr. Mortenson- he discovered this blog within two weeks of my starting it, contacted me personally, gave me much needed props, and badly needed advice. We’re good friends, we talk every week, and he mocks and goads me when I’m screwing up or not posting enough. I say all this as a public thank you. It was an obvious choice, therefore, to interview the Guru of Glass. Without further fanfare, I give you Cameron Mortenson, the King of The Fiberglass Manifesto. We're giving away one of the new Comrade motif t-shirts and two TFM decals, so be sure and enter at the bottom of this post. FR: Your Website seems to be growing a lot with the events you attend and the sponsors you’ve gotten- what do you see as TFM’s role in fly fishing? CM: From the start I didn’t have any expectation that my blog would be any different than any other blogs out there, I didn’t have a burning desire to follow a lot of readership to my website. My focus from the beginning was to highlight the work that was being done by the small shops, companies that still offered glass. About two years into it I decided that I really needed to work hard to network with all the companies. If I heard a rumor I followed up on it, I really try to do my homework. If you back up six years, seven years, back when I started fishing glass again, I was looking for information- I wanted information on the $20 Eagle Claw that I had, information about the other fly rods that I was picking up. 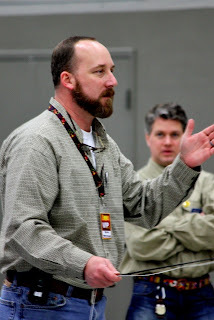 The Fiberglass Fly Rodders forum was huge for that, it was really the learning ground, the foundation for everything I’ve been able to do with TFM. As far as a role, I would say that would be to provide a resource. Websites, awareness and putting out new builds and highlighting the work that rod shops do. 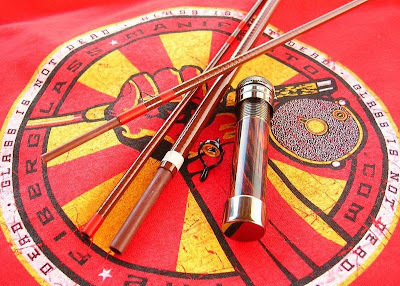 Some of the big companies have fiberglass rods, (but) they have their own marketing, their own advertisements. There’s a lot of these small rod shops that are doing some really phenomenal things within fiberglass. TFM is a good resource for them to have their builds shown off. It’s interesting to be able to help them out. FR: Nice, so any particular achievements that you’re proud of through the blog? CM: When I talk to builders who did not think that they could build rods full time or even make enough money for them to make it worthwhile for them to do. Several builders through the exposure on TFM , through the exposure on Fiberglass Fly Rodders, and then just from getting their rods into peoples hands, they’ve gone from just a few orders, to dozens of orders the next year. I know one builder that’s built almost a hundred rods in the last year, almost all of those have been fiberglass. Typically a rod will go up for sale on his website and it’ll sell as quickly as 15 minutes later. Things don’t sit around long and sometimes these guys will buy one rod from a maker and call up and say “I want the two weight that you offer and I also want this this and this..." they’re ordering multiple rods. It’s really neat to funnel people to the correct builder that is the best match to their budget, to what they’re looking for. FR: So you’ll actually help people find a rod builder? CM: Oh yeah, all the time. I ask people what’s your budget, because not everyone drops $600 on a fly rod and you don’t need to. If somebody says what their budget is, what line weight they’re looking for, what length, and how soon they need a fly rod then I can break it down for them, say "these are the options". CM: ...a small part of that. It’s really really fun to converse with somebody and several months later get an email back and they’re so stoked about the fly rod and it’s exceeded their expectations. FR: What do you think is the appeal of fiberglass? 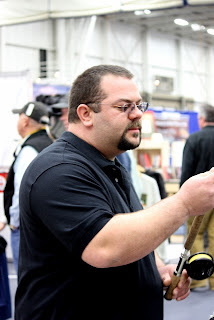 CM: In the fly rod industry, the graphite side of it, everything has gotten faster and faster every year, it’s almost like rod companies are one-upping each other on fast action rods. Truth be told, it’s very seldom that you need to air out an entire fly line. Typically most people fish within thirty to fifty feet. If you can lay down thirty feet of line you can catch fish- you don’t necessarily need a fast-action rod to do that. Fast action rods are great for casting long distances, tight loops etc., but you can achieve those same distances with fiberglass. In my opinion they’re a heck of a lot more fun to fish because you can feel a big fish head shake all the way down into the cork, you have the whole length of the rod that you can use for leverage, because a medium action rod, you’re going to get that full rod bend, it’s not going to just be the tip section. You’ve got tippet protection if you fish light tippets. Our tailwater fisheries , anywhere you fish midges, tricos—it’s seldom that I break fish off because of tippet. You can feel the rod load when you cast which is good, fiberglass is great in close for roll casting, you can pick streams apart with a glass rod. FR: Sweet. Is Glass a fad or is it here to stay? CM: Oh I think it’s definitely seen a resurgence over the last few years, but I think that’s the flip side of everything going faster and faster. I think that as graphite comes more to the center again, which it looks like it’s doing, you’ll probably see fiberglass and graphite meet again. I think fiberglass will always be a niche, it will never have the marketplace that it had before, but it really opens the door for a lot of small shop artisans to do really neat things, and fiberglass is becoming special like bamboo. In some ways it’s more obtainable because a very high-end glass rod is going to run you $600. FR: Do you think that TFM has played a role in that resurgence? FR: I think you’ve put a cool face on it though, with the shirts and the…. CM: I really think it’s the builders. 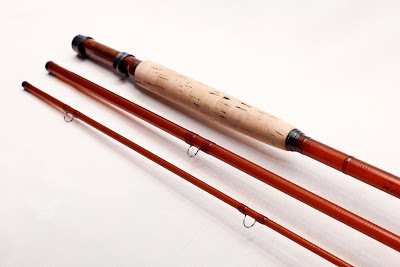 I could beat this drum about fiberglass fly rods but if the rods didn’t cast well, if the rods didn’t look nice, if they didn’t fit applications where people fish, if it didn’t make sense, if they were too expensive, if they don’t sell, I mean I could write ten blog post a day and it would just go nowhere. FR: You crank out a lot of blog posts every week, how do you balance all that? CM: I always try to put content together that is interesting, I wish I had more time do more legitimate writing on TFM, but with a full work schedule and a family it doesn’t always allow me to do that. I know people enjoy having a daily read whether it’s a new rod build, a new video or tip them off to a new reel maker, whatever it is, it’s neat to be able to put that content out there. FR: TFM seems to be driven by a strong sense of style from the retro designs to the new Comrade motif—where does that come from? CM: You know, as far as the T-shirts, when …. FR: Well it’s more than the T-shirts—I guess I should include the types of reels, the beautiful rods, your whole site seems to revolve around a whole philosophy on style. CM: Well, I’m a real visual person. I did a lot of art growing up, I took college level classes when I was in fifth and sixth grade, had private art instruction and it’s…. 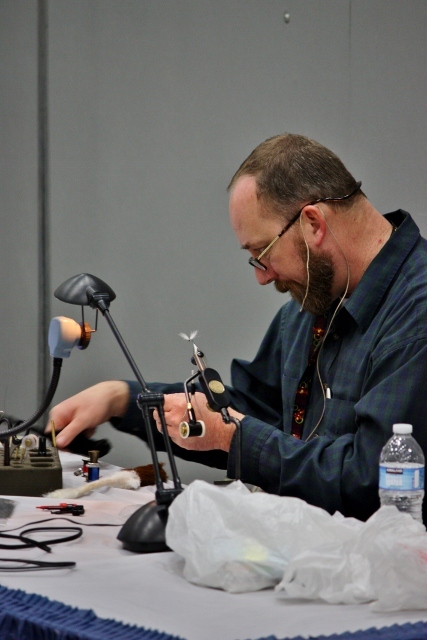 (long pause) I no longer have time to paint and draw, but when I started fly fishing and fly tying-- there’s a very artistic side to fly fishing, which is probably why I’m so drawn to a lot of the work that the rod makers do, the fly tyers- I’m blown away by fly tyers, and even reel makers. Every aspect of fly fishing has a sense of style to it. So I’m drawn to things visually and those are the things I end up promoting on TFM because I figure if I get a kick out of it . . . a lot of times those things also function very well. Form and function, being beautiful together is something quite interesting. Putting pretty pictures on TFM makes the website look better too. I try to be really picky about the images that I put on TFM. It’s not uncommon for me to shoot on a week-long trip 2000, 2500 images, but I maybe only use 150 of them. If we were still shooting film, we would be very poor. 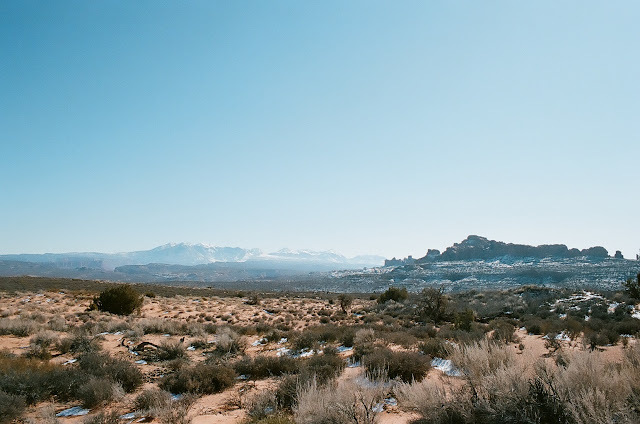 If you shoot film I think you spend a lot more time at composition, you were making that click count, now you can blow through a dozen clicks from a few different angles and pick one of them out that works. FR: You’ve been on several cool looking fishing trips over the last year, so what was your favorite? 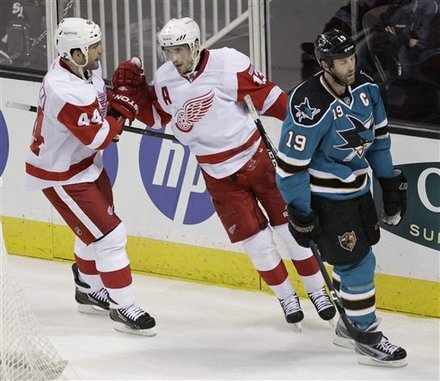 CM: The Michigan trip last summer was just outrageously cool. It’s not common for me to get days in a row to fish. That only happens maybe once or twice a year. I criss-crossed Michigan for the next five days meeting up with a lot of people I’d met online. I started out with one of the guys from Fiberglass Fly Rodders, and fished around Ann Arbor and Ypsilanti and caught carp on mulberries, and then drove directly up and had dinner with Koz and hit a small stream with him, caught brook trout. Twenty minutes later I jumped in the boat with you and Philly and we did the night float swinging mice patterns until 5 AM and was in and out of consciousness on that…. CM: …I went to Adam’s house, caught a couple hours of sleep, got up, ate breakfast and then we hit the Jordan River for brook trout, and then packed up the car, drove up to the UP and spent the rest of the weekend at Frenchman’s Pond which was nothing short of a spiritual experience. I caught a brook trout there. Then I came back down and fished Bay View, caught smallies in the rocks at Bay View, then the final day flew over to Beaver Island and caught fish with Steve from Indigo Guide Service and caught unbelievable smallmouth on the flats. 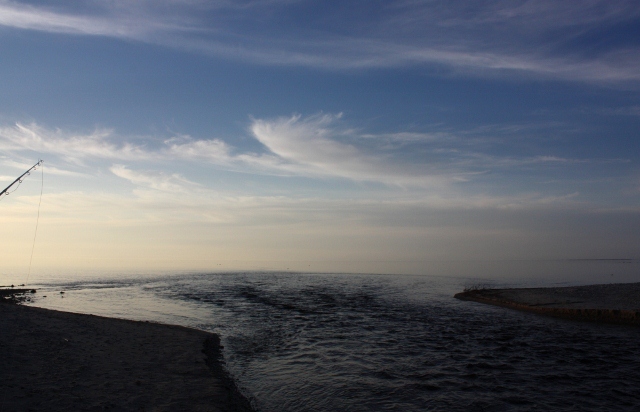 (the) Michigan trip, I had no expectations if I was going to catch a carp, I didn’t know if I was going to catch a fish at night, didn’t know if I was going to catch a smallmouth, didn’t know if I was going to catch a brook trout at Frenchman’s pond. All the pieces came together, and I caught some really special fish in some really special places, with some really special friends that I’ve made through the course of writing TFM. FR: Any situations you can think of where you couldn’t or shouldn’t use glass? CM: I’ve flushed all my graphite except one spey rod, out of the 30 or 40 or 50 fly rods that I have. Those aren’t all my fly rods- a lot of them are long-term demos, rods that kind of rotate in and rotate back to the different rod companies and builders. I know guys that are gonna do shark trips and bluefish and cobia all on glass. Truth be told a lot of the saltwater rods have glass in them, they’re either a half or third fiberglass anyway. Once you get into your conventional tackle, your tuna rods and stuff like that, that’s all glass. Ted Williams and all those boys down in Key West forty years ago, they weren’t fishing graphite to tarpon, they were fishing glass- it gets it done. It would probably look pretty funny if I had a graphite rod in my hand…. FR: (laughing) after all the T-shirts…. FR- Cameron- thanks for doing the interview, appreciate it. I’ll wear my new shirt with pride. Now here's your chance to win one of his newly designed Comrade motif shirts and two decals. Enter. Win. Do it now. Contest ends Wednesday March 21 at midnight, with the winner announced the next day. "That's a good take". I have a habit of saying this when I hook up on a trout. From the moment I started this blog I envisioned doing a series of interviews. I would call it "Good Takes". I started this tradition with my interview of Brian Kozminski, one of my favorite interviews of all time. 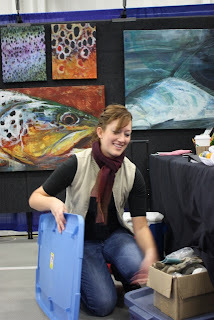 I've recently attended the Midwest Fly Fishing Expo and interviewed seven individuals, each with their own place in this world of fly fishing. I want to introduce them to you here. Over the next few weeks I will be sharing their interveiws- each have their own unique story to tell, please listen. Lou Burhart let me cast his beautiful works of art, and filled me in on his artistry and love of bamboo. Eric Stroup may be the Grand Master of this world. His interview is brief, to the point, and exciting. Shane Gray allowed me into the world of fiberglass rod building. His rods are a dream to cast. Stay tuned. Mike Schmidt is perhaps my favorite tier out there. He gives some keen insights into what it takes to tie a great streamer. Ah, April. How do you not love April? Turns out, she really is the girl next door who loves to fly fish. She fills us in on what it means to go Ape. Finally, Au Sable river guide Kelly Neuman delivers a fascinating account of life and fishing success on one of Michigan's most heavily used and fished streams. 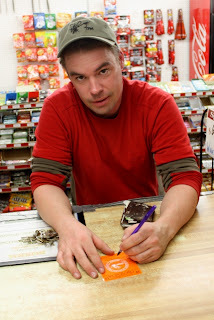 Chris Weston is an author from Northern Michigan. While he has been writing for nearly 20 years, his children's book "Hawgeye" is his first published book. Chris has won the Michigan Hemingway Society Short Story Contest with his story "The River's Best", and this book has been given a seal of approval by the Dove Foundation. A young boy named Billy loves to fish. His father doesn’t have time to fish with him, so Billy rides his bike into town whenever he can to fish the local reservoir. In the course of this short little book, a dream comes true, he reconnects with his father, and gains a mentor. Hawgeye was written by Michigan author Chris W. Weston. It is a delightful tale of childhood and adventure, and the simple pleasures of growing up in a rural small town. While written primarily for kids 8-12, it struck a chord with me for it mirrored so much of my own childhood- a busy father who rarely took me fishing, riding my bike to town with my rod across my handlebars after I had finished my chores, standing at the local sporting goods shop lusting after gear and lures I couldn’t afford. My first walleye was about the same size as Billy’s in the story. Billy finds a fishing mentor in the end (I think that’s safe to say this without giving away too much) and I too had a few older friends who took an interest in me and took me fishing, showing me the ropes, and introducing me to new and exciting angling adventures. Parents- if your kids are interested in the outdoors, or even just a summer adventure, this is an excellent book. In a world in which our kids are growing up way too fast and spend too much time surrounded by electronica (if you can't peel them away to read, each book includes a code for a free download of the e-version), Hawgeye captures that childhood sense of adventure and wonder in a simpler setting and time- the summertime joys of a bicycle, a worm on a hook, and the freedom to be a child. Awwwwgggghhhhh wow. Yawn stretch scratch- what happened? What a weekend. Why am I covered in glitter? Oh yeah, the glitterati. Shane Gray, Cameron Mortenson, April Vokey, Brad Petzke, Tommy Lynch, Becca Schlaff, Kathy Scott, Mike Schmidt, Wayne Snyder, Lou Burhart, Mike Schultz, Eric Stroup and the list goes on and on, my apologies to those I've failed to mention. I got to talk to them all, meet more people than I can remember, cast a ton of rods, conduct interviews, and buy schwag, and I did it all for you my friends, all for you. I cast a ten foot two-handed glass rod by Shane Gray, a ten minute interview with April turned into a three hour heart to heart, I got invited by several people to fish some really cool waters, got invited to join an expedition or two, cast more rods, attended seminars galore and generally had a great time. So let's have some coffee. The big news was the show, but there will be plenty of time for that later on. I did get out and fish Wednesday night, despite the need to prepare for the show. After the big storm last weekend and then heavy rains early in the week the rivers were high and dirty, but conditions were perfect and I hooked up on two fish that took me to the cleaners. The first was a yard long, chrome bright and unstoppable. Cool stuff. The weather took a turn for the nasty by Friday, and I had to leave for the Expo in a ground blizzard. It didn't take too long to drive out of it, but for awhile it was scary. I got to meet Jeff Ryan of The Freshwater Fly. He is an OBN member, a great fisherman and fellow kayaker, and lives right here in Michigan- he's a great guy and was a lot of fun to talk to. We're going to fish together this year, I'm certain. Jeff is the man behind that hilarious wiener dog fishing video that made the rounds awhile back. I'm going to share it here again even though most of you have probably already seen it so that I won't have to search for it anymore. Starting this week I'll have a series of interviews and several giveaways stemming from this show. I want to thank Lou Burhart, Cameron Mortenson, Mike Schmidt, Eric Stroup, April Vokey, Shane Gray, Joe Sprys, and Kelly Neuman for allowing me to intrude on their show time and for sharing something of themselves. Several interviewees have donated swag, books, flies, and a half-dozen streamers and a fly box to give away in conjunction with their interviews. These are fantastic interviews of good people. Two are rod builders, several are authors, several are fly tyers, and several are professional guides (there's some overlap in skill sets). My April Vokey interview will probably have to be broken up into two or more posts, as it went on for more than 3 hours. Before you cry foul, "equal time for your interviews", I only asked for 10-15 minutes from ALL of my interviewees, but for whatever reason April chose to spend the extra time. Half of the material will never see the light of day, but April has enough that is relevant to say in the other half that I think it should be shared, seeing how she took the time. I have a feeling that what little I don't know about her now I don't want to. Things got a little hazy toward the end- I know she made me play two hands of poker, and I think we may be blood brothers now, but I'm not sure. Look for my first interview to post Wednesday- It will be of Cameron Mortenson of The Fiberglass Manifesto, and he's put up some T.F.M. swag to kick this off right. I had a great time with Cameron and can't thank him enough for his encouragement and shenanigans to make sure I attended. To whom it may concern, I will post links with all the interviews I share, but this post was too target rich to do that. My apologies to the offended. Well, I really screwed up this morning- Daylight Savings Time kicked in this weekend, but because I was gone, I forgot to reset my clocks at home and got up a glorious hour late- good for the body, bad for the career. I had more to say, but this will have to do. I'll be posting a children's book review this evening, so parents- look for that, then look for my interview with Cameron by Wednesday. I've got lots of cool stuff coming up. If you were at the show, I'm going to put together a "photo album" to share tomorrow or Thursday. Okay- I absolutely have to run out the door this second, so stay tuned, have a great week, and spend some time on the water if you can. It's 6 AM, and the sound of typing wakes me up. Cameron is working on T.F.M. posts. He works through them with skill and ease, an obvious pro. Cameron can whip out two blog posts in the time it takes the rest of us to tie our shoes. I'm resisting the urge to look over his shoulder. I got to the Expo Center around 6 PM last night, picked up my press pass, and managed to bump into the likes of Derek DeYoung, Matt Zudweg, and April Vokey. Jeff, from Brookhaven Lake gave me some info on the grayling and brook trout fishing they have, and I was pleased to see he had copies of the Cedar Sweeper magazine at his table. I was even more pleased to see that I have an article in the new issue- pleased and surprised. When did I write that? 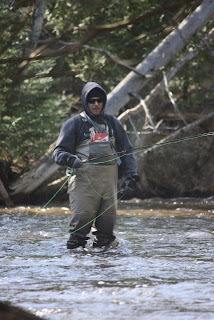 For me, fly fishing has always been a solo pursuit, and the social aspect of it is fairly new. I attended this show last year and had a great time, but this year I'm here in official capacity and get to see it from the inside out. I've also been blogging, writing and networking for the last year, and more people know me. Tommy Lynch, The Fish Whisperer himself, comes wandering down an aisle and so I show him his picture in my article in Blood Knot. He had no idea. 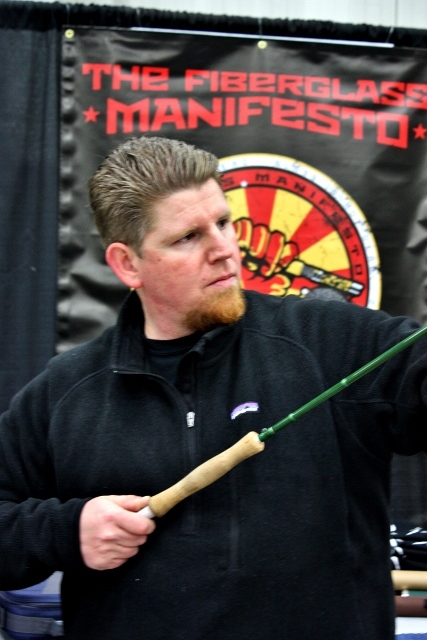 Lou Burhart has button-holed me to cast his bamboo rods and talk a little grass- I'll add him to the interview list. We went to the hospitality dinner put on at the hotel and had a decent dinner. I'm sitting between two guys I don't know. One turns out to be a rod manufacturer from Rochester New York, the other guy, I'm not sure what he does. 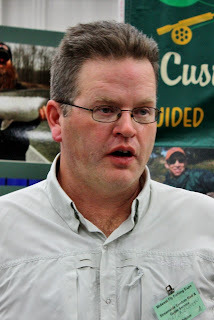 Mortenson know's two of the guys at the table, and a husky dark-haired fellow reaches across the table to shake my hand with his own great meaty paw- it's Shane Gray of Gray Wolf Rods. He likewise button-holes me to cast his rods, a request I am quick to accept. This may be my favorite part of such a show. The room is poorly lit, the conversation a little subdued despite the room having at least 250 people in it. There is an undercurrent of excitement that is palpable. Everyone is friendly, congenial, everyone says this is their favorite show that they do. I arrived as soon as the doors opened this morning. Becca Schlaff is carrying in paintings, and everywhere is the hustle and bustle of vendors putting the last polish on their booths. It's going to be a great show. I had the chance to sit down Joe Sprys and ask him a few questions about the show. 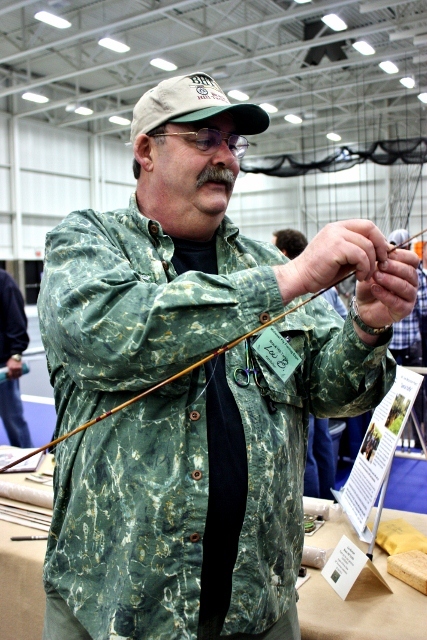 He's the show's coordinator and a member of the Michigan Fly Fishing Club, which puts on this Expo each year. FR: How long have you been having the Expo? Joe: This is the 34th year for the show. It started out as the Rod Makers Gathering. FR: Excellent. How many vendors do you have this year, and how many people do you expect to attend? Joe: We have 138 vendors this year. Attendance has steadily grown over the years, and we were just shy of 4000 last year, so we're hoping to top that. FR: I've talked to quite a few vendors so far and everyone says this is their favorite show of the year. What do you think explains that excitement? 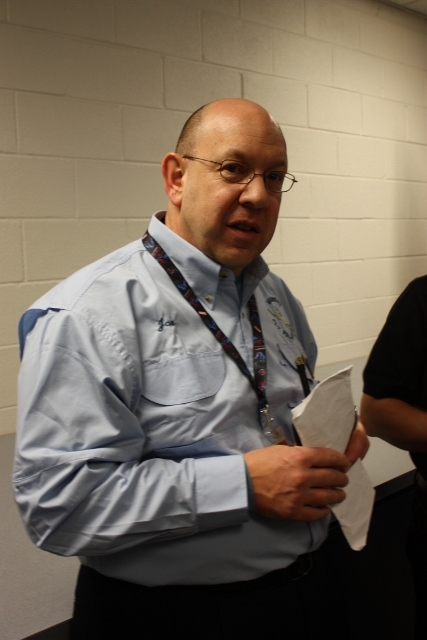 Joe: we have a great club, a tremendous volunteer force, 125-150 volunteers involved with the show. For a lot of the vendors, this is the last big show on the circuit, they're on the road for back to back shows all winter, and so they know they're going home after this and let their hair down and have a little fun. FR: Can you tell me a little about the Michigan Fly Fishing Club? Joe: Sure, it was started in 1975, we have about 350 members, and we are an independent club (not part of FFF or TU) dedicated to conservation issues and through this event we've been able to raise nearly $600,000 for conservation. FR: Well, I know you're busy with this event so I'll let you get back to is. Joe: Great, thank you very much!